Imagine the images displayed at the contrast and resolution levels you have learned to expect! All this is now possible thanks to UltraSPECT®'s exclusive Wide-Beam Reconstruction (WBRTM) technology! WBR technology resolves the well-known trade-off between sensitivity and resolution in Nuclear Imaging, enabling dramatically shorter scan times without compromising image quality. 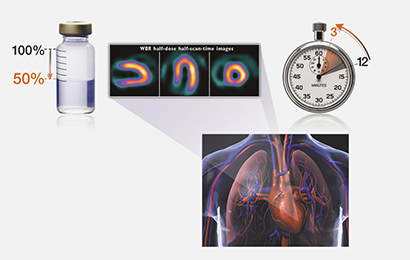 WBR, with its strong track record of half-time imaging proven in hundreds of installations worldwide, has now reached the zenith in Nuclear Imaging practice with the new Xpress3.Cardiac quarter-time image reconstruction package! The benefits are simply breathtaking! You Owe it to Your Practice...You Owe it to Your Patients...and to Yourself! And get Undiminished Image Quality and Diagnostic Certainty? And get Unmatched Patient Throughput and Department Productivity? And get Significantly Improved Patient Tolerance and Cooperation?